Scranton Products are designed to be Worry Free Partitions. You may have seen their slogan on their slide bolt latches, “Scranton Products: Designed to be Worry Free”. They are more popularly known as Hiny Hiders, Eclipse, or Resistall Bathroom Stall Partitions. The Hiny Hiders Partitions, Eclipse and Resistall offer different appearances or designs. 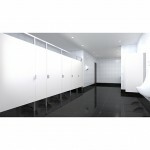 The Hiny Hider line is what you visually expect from toilet partitions, boxy with gaps, and very institutional. The Eclipse line uses metal framing instead of pilasters, so it has a cleaner look. The Resistall line are very light weight, because they use two 1/8″ thick sheets that are bonded together, instead of the standard 7/8″ thick solid plastic. The Hiny Hider Bathroom Stalls are constructed of 7/8″ to 1″ thick solid plastic HDPE, that have the same color through out the material. The pilasters are 1″ thick and the doors and panels are 7/8″ thick. They are available in a large selection of colors, and can be mounted ceiling hung, floor mounted or floor to ceiling. 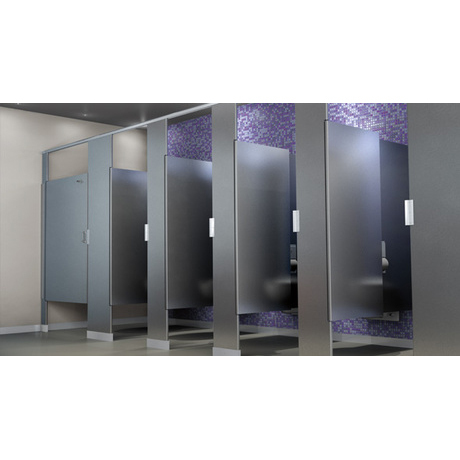 These are very rugged partitions, and are perfect for Schools, Government Buildings, and any high moisture areas like locker rooms. The Eclipse Bathroom Stalls are a newer style in partitions. Instead of a matching color pilaster, you have a metal frame. The benefit of the metal framing is higher privacy, hidden brackets, and easier installation. Installation is much easier because the framing can be easily trimmed in the field to accommodate uneven floor and walls. 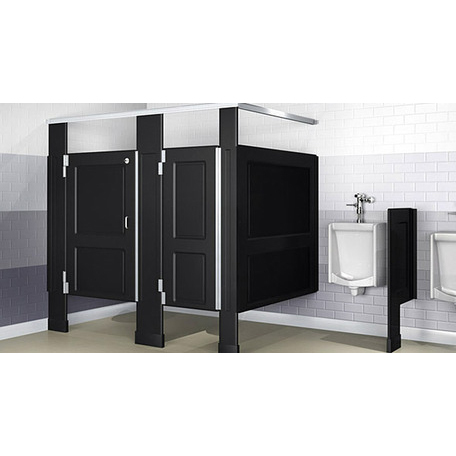 The Resistall Bathroom Stalls are engineered plastic, offer quick installation, have paneled aesthetics, and are priced comparable to metal partitions. On this line only Scranton Products takes two 1/8″ thick sheets and bonds or fuses them together for the panels and doors. The pilasters are still 1″ thick to provide the highest rigidity. This creates a very strong, yet light door, panel or pilaster. Because the pieces are lighter weight, they are very easy to move around into position. The doors also offer an aesthetically pleasing paneled door look. Solid plastic partitions are an investment, but with this product line, the prices are comparable to powder coated steel. All of Scranton Product restroom stalls are made of the HDPE Solid Plastic, which is one of the best materials for partitions. Solid Plastic is waterproof, graffiti and vandal resistant, will not corrode or delaminate, will not dent, and will never need to be painted. You can clean this material with a power washer, steam cleaner and it is resistant to most chemical cleaners. And the Scranton Products plastic come with a Class A, B and C Fire Rating. The material is 100% recyclable, and is already using a high recyclable content. All of their brands are GREENGUARD Gold Certified, which means strict requirements are met to ensure low VOC emissions. The HDPE solid plastic also resists bacteria, mold, mildew and fungus. Scranton Products has been manufacturing some of the best partitions for the past 25 years. They have been a leader in HDPE Solid Plastic manufacturing processes to provide the highest quality and innovative products in industry today. Their products are strong, low maintenance, and good looking. All of the Scranton Product lines ship quickly from Scranton, Pennsylvania, usually within 2-3 weeks. If you need assistant designing your new or are renovating your existing restrooms, or are looking for help with Hiny Hider replacement hardware, our knowledgeable staff is always willing to help.